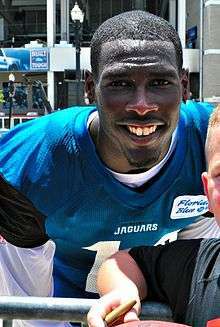 Marqise Lee (born November 25, 1991) is an American football wide receiver for the Jacksonville Jaguars of the National Football League (NFL). He was drafted by the Jaguars in the second round of the 2014 NFL Draft. He played college football at USC, where he was the Biletnikoff Award winner as the nation's top receiver and a unanimous All-American. When Lee started high school at Morningside High School, in Inglewood, California, he was living in a foster home. Lee played on an Amateur Athletic Union basketball team the summer after his freshman year of high school and became friends with Steven Hester Jr., a high school student from Inglewood attending the private Junípero Serra High School in Gardena, California. The Hester family liked Lee and, in September 2008, he moved in with them and began attending Serra. The family wanted to help Lee's younger sister, too, but were unable because of space and financial constraints. The Hesters became heavily involved in his life and continue to attend most of his games and practices at USC. At Serra, Lee was a year behind a stand-out wide receiver, Robert Woods, who also went to USC. As a senior Lee had had 57 receptions for 1,409 yards and 24 touchdowns as a wide receiver and 45 tackles and three interceptions as a defensive back. Lee was considered one of the top high school recruits in 2011. A number of major NCAA Division I FBS college football programs offered him athletic scholarships and Lee made official visits to Florida, Miami and Oregon before choosing to attend USC. Lee was also a sprinter and jumper for the Junípero Serra High School's track team. He set a personal-best leap of 13.59 meters in the triple jump at the 2010 CIF Division IV Meet. At the 2011 CIF Division IV Meet, he won the long jump with a leap of 7.52 meters, and recorded a career-best time of 10.74 seconds in the 100-meter dash, placing second. His jump of 7.52 meters was ranked 2nd best among all the 2011 prep class. He also ran the 200-meter dash in 22.11 seconds at the 2011 Del Rey League Championships, placing third in the finals. While attending the University of Southern California, Lee played for the USC Trojans football team from 2011 to 2013. As a true freshman in 2011, he earned a starting job at wide receiver across from his former high school teammate Robert Woods. He finished the season with 73 receptions for 1,143 yards and 11 touchdowns; due to sanctions, the 10-2 Trojans were prohibited from playing in either the inaugural Pac-12 Conference Championship game or a post-season bowl game. The combined receptions by Lee and Woods (184) and receiving yards (2,435) in 2011 were the most by a pair of Trojans in a season; Lee was awarded the 2011 Pac-12 Freshman Offensive Co-Player of the Year and named to the All-Pac-12 second team. Against Arizona in 2012, Lee set the Pac-12 Conference record for receiving yards in a game with 16 receptions for 345 yards and two touchdowns. The following week, Lee had 251 return yards against Oregon, setting another conference record. He finished the season with 118 catches for 1,721 yards and 14 touchdowns and was named the 2012 Pac-12 Conference offensive player of the year. Lee won the 2012 Fred Biletnikoff Award as the top wide receiver in the nation, becoming the first Trojan to win the award. He was also a unanimous All-American. As a junior in 2013, Lee played in 11 games, recording 57 receptions for 791 yards and four touchdowns. On January 3, 2014, Lee announced that he would forgo his senior season and enter the 2014 NFL Draft. During his three-year career he had 248 receptions for 3,655 yards and 29 touchdowns. Lee also competed on the USC track & field team in the spring, competing in the long jump and sprint relay. He qualified for the NCAA championships in the long jump at the 2011 NCAA West preliminary rounds, setting a career-best leap of 7.76 meters. Lee was drafted 39th overall in the second round of the 2014 NFL Draft by the Jacksonville Jaguars. ↑ Pedro Moura, Aunt: Marqise Lee's father to attend first USC game, ESPNLosAngeles.com, November 8, 2012, accessed November 10, 2012. 1 2 Pedro Moura, The rise of Marqise Lee, ESPNLosAngeles.com, April 20, 2012, accessed November 10, 2012. 1 2 Marqise Lee, Rivals.com, accessed December 7, 2012. ↑ Marqise Lee, Scout.com, accessed December 7, 2012. ↑ Pedro Moura, Analyzing the season-opening depth chart, ESPNLosAngeles.com, August 29, 2011, accessed December 7, 2012. ↑ Marqise Lee stats, ESPN.com, accessed December 7, 2012. ↑ Marqise Lee bio, USCTrojans.com, accessed December 7, 2012. ↑ Paul Myerberg, USC wide receiver Marqise Lee sets a Pac-12 record in loss, USA TODAY, October 27. 2012, accessed November 10, 2012. ↑ Pedro Moura, USC starts Heisman campaign for Lee, ESPNLosAngeles.com, November 7. 2012, accessed November 10, 2012. ↑ Rich Hammond, USC’s Lee, Williams win Pac-12 football honors, 'Orange County Register', November 26, 2012. ↑ Gary Klein, USC football: Marqise Lee wins Biletnikoff Award, Los Angeles Times, December 6, 2012, accessed December 6, 2012. ↑ Walter Camp 123rd All-America Team, Walter Camp Foundation, December 6, 2012. ↑ Richard Hammond, USC's Lee becomes unanimous All-American, Orange County Register, December 14, 2012. ↑ Gary Klein, Marqise Lee making another big leap at USC, Los Angeles Times, March 27, 2012, accessed December 7, 2012.